Learning how to play and construct minor 7th chords on guitar is a great way to expand your repertoire and add richness to your playing. And like most chords they aren’t as daunting as they sound. The only difficulty in playing these chords, if any, comes from having something new to learn – but once you have practiced them enough they will feel as natural and familiar as any other chord. What is a minor 7th chord? 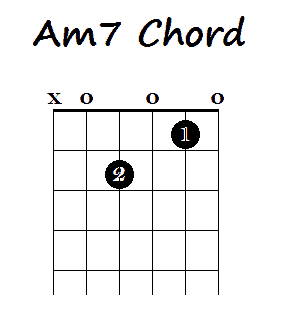 A minor seventh is a minor chord with a minor 7th note added to it. So for example, a D Minor chord has the notes D, F & A. 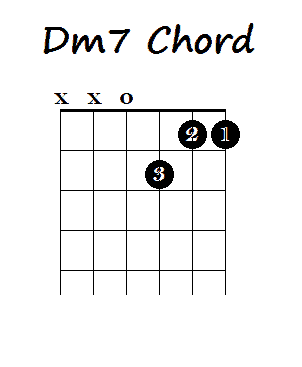 D minor 7 (written as Dm7) adds in a minor 7th note – which is a C. So Dm7 contains the D, F, A & C notes. Don’t worry if you don’t understand this fully. If these terms are new to you it might take a little bit of understanding. Once you play around with it a bit on the guitar it will become clearer. And, even though I find it is useful to know, you don’t necessarily need to understand the theory to play the chords. Below are a few different minor 7ths as open chords. I have only shown those that are easy to play as open chords. For all other chords see the barre chords below. There are a couple of options for the Em7. One uses the normal open Em and adds the minor 7th (D) on the B string (3rd fret) – see above. The other just uses one finger to play the chord. This is achieved by simply lifting off the 2nd finger when playing the Em – see below. Take the pattern of the Dm7 shown above, except now play it using your 2nd third and 4th fingers. Then slide everything up one fret. Now add your first finger onto the D string in the 1st fret. Strum or finger pick only the first 4 strings (i.e. don’t play the 5th (A) or 6th (Low E) strings. You’ve now played a D#m7. Move everything up one fret and you now have an Em7 (in a different position to the open Em7). 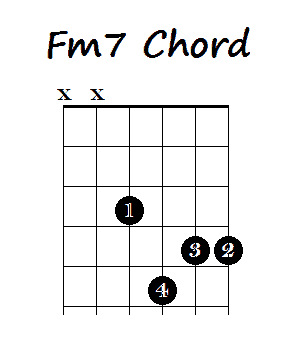 The Fm7 using this pattern is shown in the chord chart below. 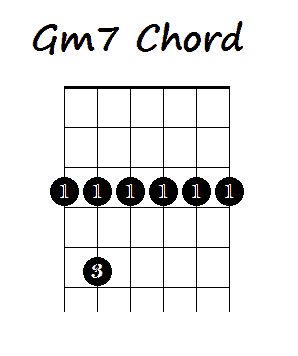 Now we move into constructing minor 7th chords using barre chords. Like the m7’s on the D string (and with all other barre chords) only one pattern is needed and is then the same pattern can be repeated up the fret board to change the chord. This one is pretty easy assuming you’ve learned your minor barre chords. Simply set up for your minor barre chord and lift off your 4th finger. Voila! 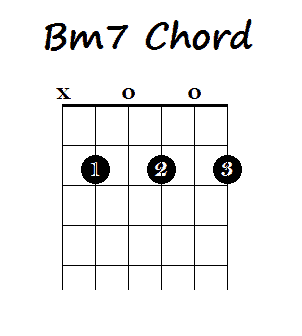 You now have your m7 barre chord pattern for 5th string (A string) barre chords. You will notice (as is always the case with barre chords on the A string) that the pattern being played by your 2nd and 3rd fingers is the same as the open Am7. 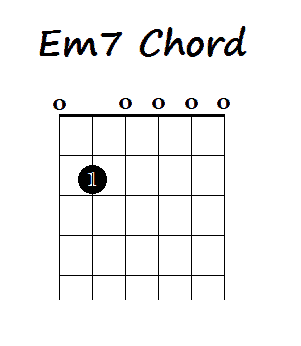 The example chord below is a Cm7. 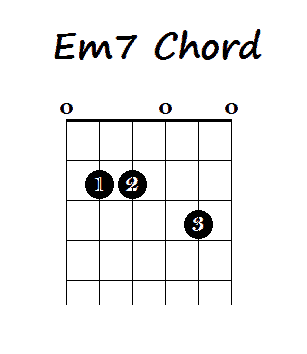 As is the beauty of barre chords the pattern for the barre minor 7th chords on the E (6th) string is the same shape as the open Em7. Now there were two options for the open Em7 above. You can play it with the first pattern but you may find this quite difficult though it is certainly doable. 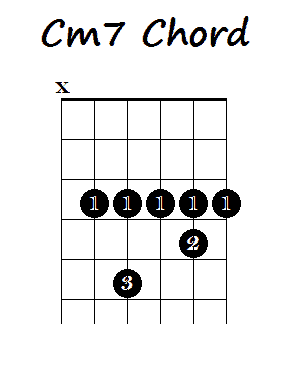 The easier way is to play this is by using the 2nd Em7 pattern above. The easiest way to think of it is to setup for your minor barre chord and then simply lift off your 4th finger and you have a minor 7th barre chord. The example chord below is a Gm7. This may feel a little bit above your head at first but once you practice these for a while they will become like second nature just like the rest of the chords that you have learned. If you haven’t yet learned your major and minor chords and dominant 7th chords I encourage you to learn these first before trying minor sevenths. It will be less confusing if you already have a grasp of chords. Thanks for reading and I hope you have learned a lot from this post. To get a better understanding of this stuff I encourage you to take lessons – be they online lessons or in-person lessons. Feel free to leave any comments or questions in the comments section below. I try to respond to every comment.